For Claude and Bettina Lariby 11th September 2001 is the decisive moment in both their lives. A schisma in time: before and after IngeBorg. Almost five years later, for them it still seems like the attack just happened. The events took the colour out of their lives. Claude (82) used to play every day, but he hasn't touched the piano since 9/11. Bettina, 78, quit painting. "It's not the case that lust for life has been taken away entirely from me ," Claude says. "I enjoy a good glass of wine, a nice meal, a sunny terrace. But I don't feel like playing the piano anymore. I would feel guilty. A happy note, while I'm not happy." In the living room of their beautiful apartment at the Costa del Sol there is a small table with framed photos of IngeBorg. It became an altar. Every night they light a candle for her. Bettina talks with IngeBorg. Every day. "Sometimes I've got the feeling: she is here. I think my grandmother accompanies her in heaven." In a few thick albums they save all letters, emails and faxes they received after 9/11. From September 25th, 2001 Bettina was in hospital for a major surgery and she returned home only after October 11th. In between Claude answered everybody. Every day he sent piles of letters and dozens of emails. "IngeBorg has become an album", Bettina says while browsing through the pages on their terrace. "I'm very proud of who she was. IngeBorg was my pal, my friend. She always listened, immediately made time and she felt it when you were feeling down." "She called us almost daily. IngeBorg had the way to wind you around her finger. She was charming and managed to get what she wanted." On top of a pile of books is "Schaduwkind" by P.F. Thomèse, an impressive essay referring to the death of his young daughter Isa. Under the headline: "Missing word" he writes: "A woman who buries her husband, is called widow, a husband who stays behind without his wife, widower. A child without parents is an orphan. But how do you call the father and mother of a deceased child?" Claude: "Only people who experienced it themselves are able to understand it. It never wears away. You lose a part of yourself. Is it your destiny? Why us: 1 on 16 million!" But instantly there is the perspective: "We only lost our daughter. She didn't have any children and she took care of herself. Think about all those other victims! Hundreds of families lost their wage earners. Entire families were aboard of those planes. many people lost much more than us. Who am I to complain?" As soon as the television shows footage of the Twin Towers, the Lariby's zap away instantly. Bettina: "Then I see IngeBorg in her beautiful office calling and warning us." Claude says he doesn't feel hatred against the terrorists. "That Osama bin Laden is a crook of course, a mass murderer. But if I encountered him in the street, I would just pass him by." After the attacks in Madrid and London they cried for hours. "We know what it is. And you go through it all again. It is like a festering wound which continuously opens." Of course the FBI and CIA underestimated the dangers of an attack in the time before 9/11, but Claude and Bettina don't blame the Americans for anything. They don't have complaints about the financial settlement of the disaster.They refused a small bag of soil from Ground Zero. "Oh well, what's the purpose of that?" It's 6.50 p.m. The candle for IngeBorg is already burning. 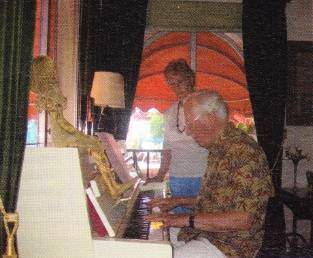 Afer some hesitation Claude goes to the piano in shorts, sits down and plays. First a bit fumble, but then more confidently. Bettina is standing next to him singing softly the evergreen: "I love you, Sandy." On the wall at the left there is a painted portrait of IngeBorg. She smiles. After about ten minutes Claude stops playing. "I still can play! It felt good, but the piano is false."